I hope you are all enjoying your weekend! I want to share with you all the nail color that I have been sporting on my nails all week. Say hello to Rise And Shine from Sinful Colors ($1.99). 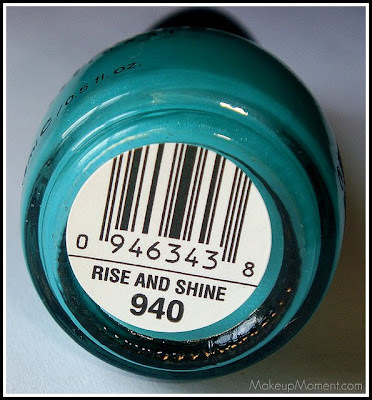 Rise And Shine is such a gorgeous, muted bright green teal cream that contains small, fine shimmers. I had somewhat of a hard time capturing the true color of Rise And Shine. These were the most accurate shots I got. I mean, they are pretty accurate, but the color is definitely much more greener and brighter. By the way, Sinful Colors nail polishes are free of DBP, Toluene, and Formaldehyde. Score! Honestly, I usually shy away from colors like this one. I have had Rise And Shine for a few months now and I can't believe that it wasn't until recently, that I discovered just how great it really was. I wish I would have sported this color more often, this past summer. Form now on, I am definitely making it a requirement to wear Rise And Shine much more. I am even shocked that the hub complimented on how lovely the color was. He hardly ever notices what color I am sporting on my nails, LOL! During application, the first coat went on pretty sheer and a little streaky , but everything evened out once the second coat was on, and I got opaque coverage. I expected to see a glossy finish on my nails once they were dry, but that was not the case. I was surprised to see that this color dried semi-matte. I much prefer a shiny and glossy finish, so of course I added a clear topcoat. In case you are all wondering, I used Wild Shine Clear Nail Protector, from Wet n' Wild ($0.99). Drying time was super quick and, lasting power was even better. I rocked this color on my nails for a week, and I only got minimal tip wear, and just a tiny chip on one nail-barely noticeable. I really have grown to love Sinful Colors nail polishes. They are affordable and the array of colors and finishes are endless! 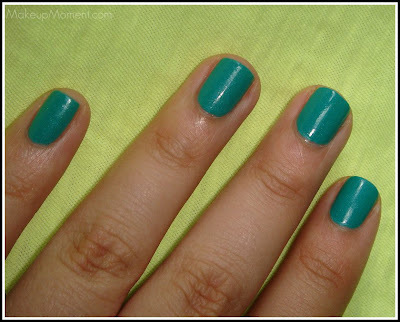 What are your favorite green-teal nail colors? I love Sinful Colors. I have a black from them that went on a little streaky at first to, but a 2nd coat & it was good. Yea, I find that Sinful colors polishes almost, always start off streaky. But the issue is resolved with the addition of a second and/or third coat. i have that shade :D loves it!